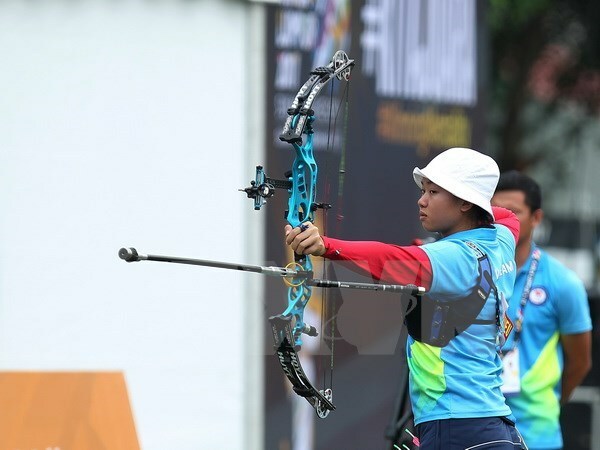 Kuala Lumpur (VNA) – Vietnamese archers Nguyen Tien Cuong and Chau Kieu Oanh defeated their rivals from the Philippines to grab a bronze medal at the mixed team compound event at the 29th Southeast Asian (SEA) Games in Malaysia. Vietnamese players took lead with scores of 40-39, 79-77, 119-116, and 159-155. The duo was beat by the host Malaysia 152-154 at the semifinal. Earlier, Chau Kieu Oanh won a silver medal in the women’s individual compound event, the first medal for Vietnam at the largest regional sport event. The trio Chau Kieu Oanh, Le Ngoc Huyen and Nguyen Thi Nhat Le pocketed another silver for Vietnam in the women’s team compound category. Ten archery categories are featured at the Games, consisting of individual recurve (men and women), recurve team (men, women and mix), individual compound (men and women) and compound team (men, women and mix).